New Orleans is often referred to as America’s most haunted city but behind that introduction you find very few answers why. Many people toss ideas out there but few have understood the complex combination of causes. I am going to shed light on some of the reasons for so much paranormal activity concentrated in one place. When you understand the bases for hauntings you are better able to fully appreciate and participate in the experiences. The most frequent answer you’ll get when you ask why New Orleans is America’s most haunted city is our landscape. I believe this is totally wrong and I’d like to get it out of the way first before I introduce what I feel are the legitimate reasons. I have heard a lot of experts say that we are so haunted because we are surrounded by water and that water somehow magnifies hauntings. Now, I have been fortunate to have lived on or near the water in several cities like New York and Geneva, spent many summers at the beach and visited many cities with major bodies of water featured in the landscape. I have never found that to be a determining factor in the levels of paranormal activity. The island of Manhattan is surrounded by water, just as New Orleans, but it is much less actively haunted. So now that has been examined, here is a list of what are, in my opinion, the top 7 reasons that we have so many dead residents. 1. Catastrophe – One of the biggest reasons for hauntings are catastrophes. It seems every 50 years or so, New Orleans is dealt a catastrophic blow, hurricanes, major fires, epidemics and wars that take a lot of people abruptly to the other side and cause the city to have to resurrect. An example would be the year of 1853 when 7849 lives were lost to yellow fever. Imagine that, entire families dead and piled up all over, what was then, a small city. There were still parts of the city that were swamp. Where did all of those bodies go? Where did all of those lost souls go? Many of them still wander because death came like a thief in the night and struck without warning with a catastrophic event. When one exits in that manner, the spirit can roam in a state like a concussion, an altered state in which time is meaningless and awareness is dull. These are the spirits, that if you happen upon them, you should assist in crossing to the other side. They are mostly compliant and quite happy to be roused in that direction. 2. Violence – Since our founding in 1718, we have been a rough and tumble kind of town. With an active river front with bars filled with men with cash in their pockets and vice on their minds, it set a stage for violent ends. One could walk down a dark alley in search of some fun and end up the victim of a crime – homicide. Other areas of town were just as violent. The neatly manicured and peaceful Jackson Square was the place for public hangings. The next time you are there, sitting on a bench surrounded by beauty, take a moment and envision the scaffolds lined up to drop men to their deaths. Behind St. Louis Cathedral is a small courtyard with a beautiful statue of Christ. That same plot of land was where the early Creole inhabitants fought their duels covering that ground with blood. More recently we have one of the highest murder rates in the country. As long as the violence continues there will be fresh batches of spirits to roam the streets. 3. Drama – Perhaps it is the high consumption of alcohol here but we New Orleanians are quite dramatic and that is a chief ingredient to a haunting. One well known local ghost is Julie, the beautiful young Quadroon mistress of a French nobleman. It is said that after an argument, she climbed to the roof, nearly naked, to prove her love and ended up dying there from exposure. That is a pretty dramatic way to go and one that sets the stage for her soul to linger. Drama serves as a charge to add extra energy to a fateful event. This can cause higher instances of both residual, a non-conscious haunting, and active conscious haunting. 4. Limited Space – Another contributing factor to the unusually high amount of paranormal activity is the sheer concentration of events to a relatively small physical space. Up until the 1800’s we were pretty much just the French Quarter and closely surrounding areas. Roughly 78 square blocks of space that accommodated death in all of its guises. With the reasons that I have provided above, imagine those all occurring in such a confined space. Imagine how many catastrophic, violent, passionate and dramatic untimely ends have occurred there. Thousands? More like tens of thousands. There are times when I walk on the streets of the French Quarter and I can feel the spirits beneath my feet with each and every step I take. 5. Reciprocity – We pay attention, a lot of attention, to our dead. Pretty much everybody that you talk with here has had some type of paranormal New Orleans experience. Ask most locals if they believe in ghosts and you’ll get a yes. We even have picnics with the departed in our cemeteries on All Saints Day. Haunted tours fill the streets retelling the tales of those who have past. Like the ghost of Quadroon mistress Julie, many of our spirits are local celebrities and even have TV shows and books about them. We interact with them and they respond in kind. 6. Age – I’ve been blessed to have lived in some pretty old cities. In Switzerland I lived in an apartment building that had a wall built by the Romans! I’ve been in castles and ruins and have always found them to be pretty active. The older a location, the more people who have died there and the more people who have died there always increases the chances for haunting to occur. Plain and simple, we are pretty old in American years. 7 .Temperament – Everybody thinks of the South being laid back because we are. We live in an almost meditative state somewhere within the range of beta and theta waves. No one is in a real hurry to get anywhere and there is always time to stop and chat when given the opportunity. Our stress level is less and our mind less filled with junk. In other words, there is space for the dead to get our attention. I am often asked if ghosts are only active after dark and my answer is no. We are less active after dark and that gives the silence, within and without, to hear the whispers of the dead. When you mix all of these ingredients together, you get a paranormal gumbo. A little bit of this and a little bit of that come together to increase the level of ghostly activity to a very high level. This is why so many enthusiasts are drawn here, the odds that you are going to have an experience are pretty good. I have seen many skeptics turn true believers because of something they felt while staying in one of our hotels or wandering through our cemeteries. So come on down to America’s most haunted city! 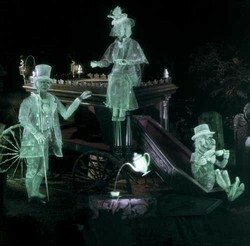 We have a welcome wagon of dead people, that span numerous generations, here to greet you and show you around! !